There are a number of reasons why you might prefer contact lenses to glasses: a glasses-free look, increased peripheral vision, reduced distortion that may occur with some eye glasses, you lead a highly active lifestyle, wearing non-prescription sunglasses and goggles. Technological advances in lens materials and design have resulted in lenses that are generally more comfortable, easier to care for and able to correct a wider range of vision problems than ever before. There are literally thousands of contact lenses available – gas permeable, soft, disposable, daily wear, color changing, color enhancing contacts, plus variations in lens material, size and shape. Because we are independently owned, we have no allegiance to any particular brand of contact lenses. This allows the doctor to make the most accurate choice when selecting your lenses based on your particular needs. We look forward to customizing contact lenses to fit your lifestyle so that your contact lens wearing experience is a healthy and comfortable one. 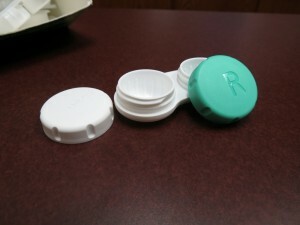 Why buy your contact lenses from Cherry Hills Family Eye Care? We are a family owned, local company, and we truly appreciate your business. It is our goal for you to be 100% satisfied with your contact lens experience. We guarantee the contact lenses you purchase from us will be fresh from the manufacturer and will match exactly the specifications of your prescription. In recent months contact lenses sold by an internet retailer were found to be counterfeited and also contaminated with bacteria. We do not want our patients subjected to this type of eye health risk. Our contact lens prices are very competitive. We will provide you with all applicable manufacturer rebates to further reduce your cost. We will also ship your annual supply of contact lenses to you at no charge to you! In the event that your prescription changes within one year of purchase, we will gladly exchange any unopened and unmarked boxes of contact lenses for lenses in the updated prescription. Regardless of the type of contact lenses you wear, an annual eye exam is recommended to ensure the continued good health of your eyes. Schedule an appointment for an assessment at our office, and we will be in touch with you shortly.